Toddler Party Ideas: Need Some Thanksgiving Party Ideas? Toddler Party Ideas: A selection of crafts, recipes and ideas for Thanksgiving Parties. Here is a selection of ideas from our website that would make any Thanksgiving Party or celebration a memorable one. Make a handprint turkey with feathers, paint and markers. Add a cute Thanksgiving poem. Here are a few printables for songs, mini books and more. Great for keeping kids busy while adults chat!! Make a kids table with crayons and some of our printables. Pumpkin Bread is a great recipe for the classroom or a Thanksgiving celebration. Muffins or loaves make a tasty treat! Oreo Turkeys make a nice centerpiece or table decorations. 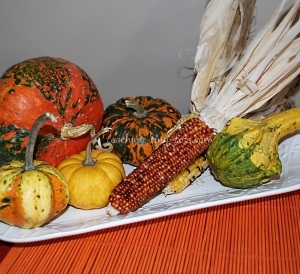 Buy an assortment of pumpkin varieties, dried corn and mini gourds and arrange in a bowl or on a plate for an easy colorful decorative arrangement. Good prices and assortment can be found at local produce stands if you have any in your area after Halloween. Pine cone turkeys are easy to make. Put a card in front of it or write on the body to make cute place settings at a dinner table. 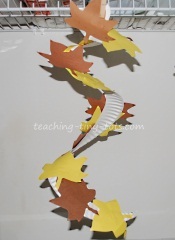 Cut out or use dies cuts of leaves in various colors of construction paper. Cut a paper plate into a spiral and glue leaves on in bunches or in patterns. Hang from the middle. Good make and take or activity to keep kids busy. Decorations for the Thanksgiving celebration or a cute gift. On a sheet of paper write or print out "THANKSGIVING" in large letters. Give each child a sheet of paper and see how many words they can make using just the letters in Thanksgiving. You can make a word with two "g's" because there are two g's in Thanksgiving but you can only the other letters once. Work in teams with younger children so they can be a part of it.